I was craving Chinese food but I also felt like cooking dinner, so this was the compromise. 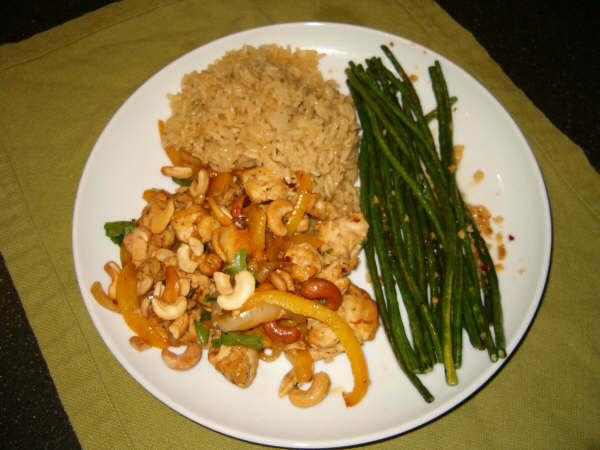 It is a Utah spin on cashew chicken with chipotle peppers, onions and garlic. On 30 Minute Meals, she calls this recipe Chipotle Cashew Chicken with Brown Rice. While I do admit that I generally like anything with onions, peppers and garlic, this one stands out in the crowd. I think it would have looked prettier with red bell peppers, but my store was out of them so I had to use yellow. I also stir-fried some long beans with garlic and red pepper flakes, then let them simmer in chicken stock for a few minutes to make them tender. I was trying to recreate the long beans at PF Changs and I haven't gotten there yet, but I'm trying! 1. In a medium saucepan over medium heat, combine 1 tablespoon of the vegetable oil (1 turn of the pan) and the butter. When the butter melts into the oil, add the chopped onion and cook for 2 minutes, then add the rice and cook for 3 minutes more. Add the chicken stock and cover the pot. Raise the heat and bring the stock to a rapid boil. Once the stock boils, reduce the heat to low and cook, stirring occasionally, until the rice is tender, about 18 minutes. 2. While the rice cooks, make the chicken. Heat a large skillet over high heat. Season the chicken with the grill seasoning. Add the remaining 2 tablespoons of vegetable oil (2 turns of the pan) and then the chicken. Brown the chicken on both sides, season with the soy sauce, then move the chicken to 1 side of the pan. Add the sliced onion, garlic and bell pepper. Cook for 2 to 3 minutes, then add the water chestnuts and green peas, and mix the vegetables and chicken together. Add the chipotle chiles and cumin. Toss to coat. Glaze the chicken mixture with the honey and maple syrup and turn off the heat. Add the chopped cilantro or parsley (whichever you prefer) and the cashews.